Is going through credit repair to qualify for mortgage recommended? Bad credit happens to the best of us. Borrowers can qualify for mortgage with bad credit. They do not have to pay outstanding collections and charged off accounts. Lenders with no overlays normally are concerned with timely payments in past 12 months. Credit Repair is often not necessary to qualify for mortgage with bad credit. 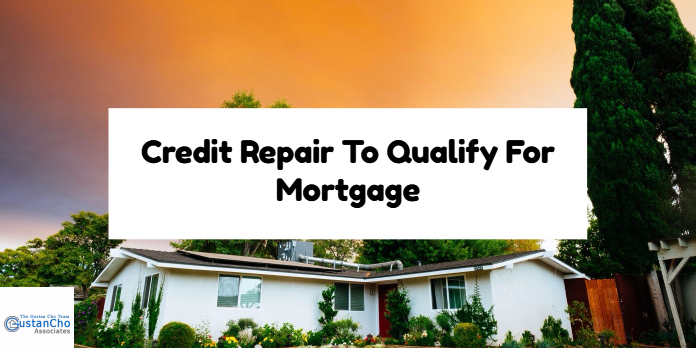 Is Credit Repair To Qualify For Mortgage Necessary? Unfortunately, most creditors will report their payment history to the three credit reporting agencies and this will hurt the consumer’s credit scores. Home Loan With Bad Credit: Is Credit Repair To Qualify For Mortgage Needed? Borrowers can qualify for mortgage with prior bad credit, low credit scores, open collections, and prior bankruptcy and foreclosure. Whether you have stellar credit or bad credit, review your credit report at least once a year for errors. Past Bad Credit: How Bad Is It? If you have unpaid collection accounts, you can still qualify for a mortgage loan with unpaid collection accounts. Consumers with unpaid non-collection accounts, as long as the total aggregate unpaid balance is $2,000 or less, than they have nothing to worry about. Borrowers can have credit disputes on medical collections and non-medical collections with zero balance. All other credit disputes is not allowed. The risk with credit disputes is when consumers retract credit disputes, their credit scores can drop significantly. Whenever consumers dispute a negative credit tradeline, credit bureaus automatically remove the disputed tradeline from the credit scoring formula. Borrowers with credit disputes and who need to qualify for a mortgage with a direct lender with no overlays on government and conventional loans please contact us at GCA Mortgage Group at 262-716-8151 or text us for faster response. We are experts in helping borrowers get mortgage approvals where other lenders cannot. We are available 7 days a week, evenings, weekends, and holidays.